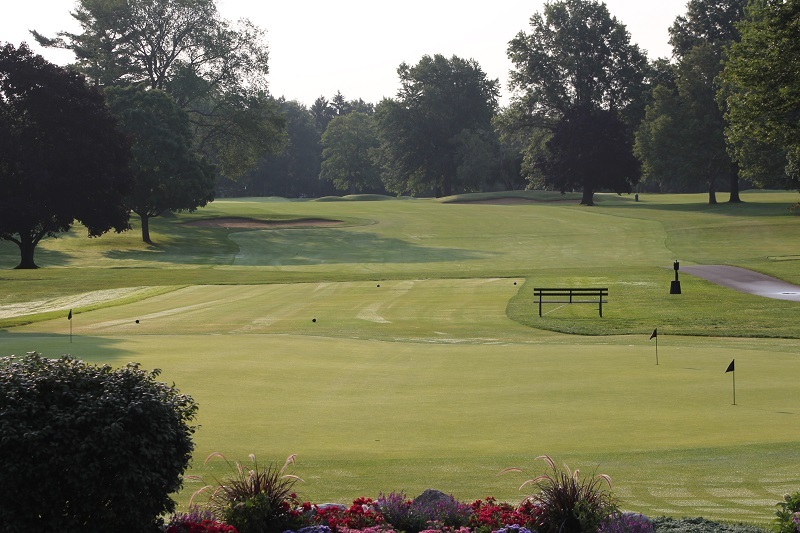 BATTLE CREEK – Classic Battle Creek Country Club, designed by legend Willie Park, Jr., will welcome the state’s top senior male golfers Monday and Tuesday for the 32nd GAM Senior Championship presented by Sullivan Golf Travel. A field of 156 golfers, 105 playing for the Senior title for golfers age 55-and-over, and 51 playing in the Super Senior division for golfers 65-and-over, will play two rounds of stroke play over the Battle Creek Country Club course. The club was founded in 1919 on the southeast shore of Goguac Lake, and 18 holes were complete by 1922 by Park, a top Scottish golf course architect. The modern clubhouse was completed in 1966, and over the years many of golf’s greats have visited the club and played the course, including Ben Hogan, Arnold Palmer and Gary Player. In recent years, with the help of consulting architect, Bruce Hepner, the club has undergone a restoration process to the original dimensions and shot values intended by Park's original design. Extensive tree work has been part of the process, and Battle Creek Country Club remains one of the best-preserved examples of Willie Park's many designs. Battle Creek CC has hosted numerous professional and amateur events, including the 2000 Michigan Amateur Championship, U.S. Amateur and U.S. Open qualifiers and is the current home for the LPGA Symetra Tour's FireKeepers Casino Hotel Championship. Doug Kreis, the head golf professional, is just the fifth professional in the club’s history. He is part of a short list of highly regarded professionals, including Chick Harbert and Ron LaParl. Mark Chappell is the superintendent, and club is managed by Steve Rebhan. Defending champion Craig Adams of Spring Lake heads the field. He shot a closing 6-under 66 to win last year at Muskegon Country Club. His 5-under two-day total gave him a five-shot win over David Bartnick of Livonia. Adams is one of six former champions in the field, including 2015 winner Mike Tungate of East Lansing, two-time champion Ian Harris of Bloomfield Hills and four-time champion Bill Zylstra of Dearborn Heights. Mike Fedewa, the 2007 champion, and Roger Kuhl, the 2003 winner, are playing in the Super Senior division.